The University of North Alabama (“UNA” or “University”) recognizes the importance of Service Animals as defined by the Americans with Disabilities Act Amendments Act (ADAAA) and the broader category of Assistance Animals ("AA" or "ESA") under the Fair Housing Act that provide physical and/or emotional support to individuals with disabilities. UNA is committed to allowing individuals with disabilities the use of a Service Animal on campus to facilitate their full-participation and equal access to the University’s programs and activities. 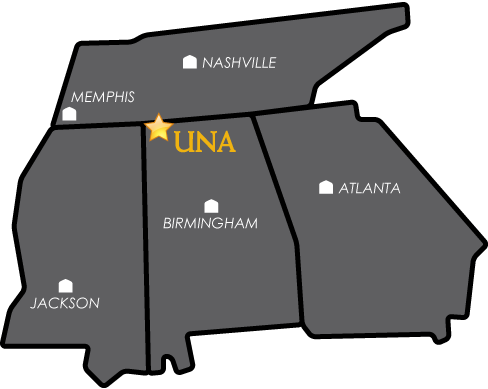 UNA is also committed to allowing Assistance Animals necessary to provide individuals with disabilities an equal opportunity to use and enjoy University housing. This Policy explains the specific requirements applicable to an individual’s use of a single Assistance Animal in University housing. UNA reserves the right to amend this Policy as circumstances require. This policy applies solely to Assistance Animals which may be necessary in University housing. It does not apply to Service Animals as defined by the ADAAA. Although it is the policy of UNA that individuals are generally prohibited from having animals of any type in University housing, UNA will consider a request by an individual with a disability for reasonable accommodation from this prohibition to allow an Assistance Animal that is necessary because of a disability and reasonable. The question in determining if an Assistance Animal will be allowed in University housing is whether or not the Assistance Animal is necessary because of the individual’s disability to afford the individual an equal opportunity to use and enjoy University housing and its presence in University housing is reasonable. Assistance Animals may not be kept in University housing at any time prior to the individual receiving approval by Housing & Residence Life ("HRL") as a reasonable accommodation pursuant to this Policy. Assistance Animals are a category of animals that may work, provide assistance, or perform physical tasks, for an individual with a disability and/or provide necessary emotional support to an individual with a mental or psychiatric disability that alleviates one or more identified symptoms of an individual’s disability, but which are not considered Service Animals under the ADAAA and UNA’s Service Animal Policy. Some AA's are professionally trained, but in other cases AA's provide the necessary support to individuals with disabilities without any formal training or certification. Dogs are commonly used as assistance animals, but any animal may serve a person with a disability as an Assistance Animal. It is important to note that animals that may be needed because of a disability may be identified by various names. For example, an individual may identify the animal as a companion animal, therapy animal, comfort animal, or emotional support animal. The handler/owner is the individual who has requested the accommodation and has received approval to bring a specific assistance animal into University housing. The Office of Disability Support Services ("DSS" or “Disability Support Services”) collaborates with individuals, faculty, and staff to ensure that individuals with disabilities have equal access to all UNA programs and activities. The University will require confirmation/documentation of the disability-related need for the specific assistance animal the student intends to have in his/her room from a physician, psychiatrist, licensed social worker, or other licensed mental health professional. This documentation must include how the specific animal requested will provide some sort of disability-related assistance or emotional support. Students will be contacted with further instructions regarding Approval/Denial and in cases of approval, the Assistance Animal Intake Meeting with Housing & Residence Life professional staff at their UNA Portal Email. Copies of all signed documentation will also be provided to the student at the Assistance Animal Intake Meeting. The procedure and requirements for requesting a specific assistance animal are as follows: AA Request Form, AA Verification Form, and Handler Responsibilities and Guidelines Form. Students must complete and submit an Assistance Animal Request Form to Housing & Residence Life. A treating healthcare provider must complete and submit an Assistance Animal Verification Form to Housing & Residence Life. The treating health care provider completing the form must specialize in a field consistent with the diagnosis, as well as be familiar with the student’s disability and the necessity for the requested AA. To avoid any conflict of interest, documentation must be provided by a non-family healthcare provider. Documentation must also show that the requested AA is necessary for them to use and enjoy their residential living space; in addition, there must be an identifiable relationship, or nexus, between the requested AA and their disability. University housing is unique in several aspects, including the mandatory assignment of roommates for individuals and the mandate that individuals must share a room, suite, or apartment in certain residence halls. To ensure that the presence of an Assistance Animal is not an undue administrative burden or fundamental alteration of University housing, UNA reserves the right to assign an individual with an Assistance Animal to a single room or apartment without a roommate. UNA will not limit room assignments for individuals with emotional support animals to any particular building or buildings because the individual needs an Assistance Animal because of a disability. For all requests for emotional support animals, Housing and Residence Life shall make a determination on a case-by-case basis of whether the presence of an Assistance Animal is reasonable. A consultation with DSS may also be appropriate in some cases. A request for an Assistance Animal may be denied as unreasonable if the presence of the animal: 1) Imposes an undue financial and/or administrative burden; 2) Fundamentally alters University housing policies; and/or 3) Poses a direct threat to the health and safety of others or would cause substantial property damage to the property of others, including University property. UNA may consider the following factors, among others, as evidence in determining whether the presence of the animal is reasonable or in the making of housing assignments for individuals with Assistance Animals: 1) The size of the animal is too large for available assigned housing space; 2) The animal's presence would force another individual from individual housing (e.g. serious allergies); 3) The animal's presence otherwise violates individuals' rights to peace and quiet enjoyment; 4) The animal is not housebroken or is unable to live with others in a reasonable manner; 5) The animal's vaccinations are not up-to-date; 6) The animal poses or has posed in the past a direct threat to the individual or others, such as aggressive behavior towards or injuring the individual or others; 7) The animal is pregnant, or 8) The animal causes, or has caused, excessive damage to housing beyond reasonable wear and tear. An Assistance Animal must be contained within the privately assigned individual living accommodations (e.g., room, suite, apartment) except to the extent the individual is taking the animal out for natural relief. When an emotional support animal is outside the private individual living accommodations, it must be in an animal carrier or controlled by a leash or harness. If an individual with a disability establishes necessity for an Assistance Animal and it is allowed in University housing, the Assistance Animal will not be permitted in other areas of the University (e.g. dining facilities, libraries, academic buildings, athletic building and facilities, classrooms, labs, individual centers, etc.). Notwithstanding the restrictions set forth herein, the Assistance Animal must be properly housed and restrained or otherwise under the dominion and control of the handler at all times. No handler shall permit the animal to go loose or run at large. If an animal is found running at large, the animal is subject to capture and confinement and immediate removal from University housing. The handler must abide by current city, county, and state ordinances, laws, and/or regulations pertaining to licensing, vaccination, and other requirements for animals. It is the handler's responsibility to know and understand these ordinances, laws, and regulations. The University has the right to require documentation of compliance with such ordinances, laws, and/or regulations, which may include a vaccination certificate. The University reserves the right to request documentation showing that the animal has been licensed. Housing & Residence Life will be responsible for verifying all documentation regarding a request for an assistance animal. The handler is required to clean up after and properly dispose of the animal’s waste in a safe and sanitary manner and, when provided, must use animal relief areas designated by the University. The handler is required to ensure the animal is well cared for at all times. Any evidence of mistreatment or abuse may result in immediate removal of the emotional support animal and/or discipline for the owner. The University will not ask for or require an individual with a disability to pay a fee or surcharge for an approved animal. An individual with a disability may be charged for any damage caused by his or her emotional support animal beyond reasonable wear and tear to the same extent that it charges other individuals for damages beyond reasonable wear and tear. The handler's living accommodations may also be inspected for fleas, ticks or other pests, if necessary, as part of the University’s standard or routine inspections. If fleas, ticks or other pests are detected through inspection, the residence will be treated using approved fumigation methods by a university-approved pest control service. The handler will be billed for the expense of any pest treatment above and beyond standard pest management conducted in University housing facilities. The University shall have the right to bill the individual‘s account for unmet obligations under this provision. The handler must fully cooperate with University personnel with regard to meeting the terms of this policy and developing procedures for care of the animal (e.g., cleaning the animal, feeding/watering the animal, designating an outdoor relief area, disposing of feces, etc.). Animals may not be left overnight in University housing to be cared for by any individual other than the handler. If the handler is to be absent from his/her residence hall overnight or longer, the animal must accompany the handler. The handler is responsible for ensuring that the emotional support animal is contained, as appropriate, when the handler is not present during the day while attending classes or other activities. The handler agrees to abide by all equally applicable residential policies that are unrelated to the individual’s disability such as assuring that the animal does not unduly interfere with the routine activities of the residence or cause difficulties for individuals who reside there. An emotional support animal is allowed in University housing only as long as it is necessary because of the handler's disability. The handler must notify Housing and Residence Life in writing if the emotional support animal is no longer needed or is no longer in residence. To replace an animal, the new animal must be necessary because of the handler's disability and the owner must follow the procedures in this policy when requesting a different animal. Animals may not reside within University housing while pregnant and the University may request documentation that the animal has been neutered. University personnel shall not be required to provide care or food for any animal including, but not limited to, removing the animal during emergency evacuation for events such as a fire alarm. Emergency personnel will determine whether to remove the animal and may not be held responsible for the care, damage to, or loss of the animal. The individual must provide written consent for University personnel to disclose information regarding the request for and presence of the animal to those individuals who may be impacted by the presence of the animal including, but not limited to, potential and/or actual roommate(s)/neighbor(s). Such information shall be limited to information related to the animal and shall not include information related to the individual’s disability. The University may require the individual to remove the animal from University housing if: 1) The animal poses a direct threat to the health or safety of others or causes substantial property damage to the property of others; 2) The animal’s presence results in a fundamental alteration of a University program; 3) The owner does not comply with the handler's responsibilities set forth above; or 4) The animal or its presence creates an unmanageable disturbance or interference with the university community. The University will base such determinations upon the consideration of the behavior of the particular animal at issue, and not on speculation or fear about the harm or damages an animal may cause. Any removal of the animal will be done by Housing & Residence Life in consultation with Disability Support Services and may be appealed to the Vice President for Student Affairs. The owner will be afforded the rights of due process and appeal. Should the emotional support animal be removed from the premises for any reason, the handler will be allowed to appeal for release from the Residence Hall Contract. The University of North Alabama will not retaliate against any person because that individual has requested or received a reasonable accommodation in University housing, including a request for an assistance animal.